Save money when you take a trip to Chicago by booking your flights at the best time. Select your tickets at the right point before your departure and you could make considerable savings. Chicago is an increasingly popular destination in the United States. The Windy City features a distinctive skyline, bustling commercial neighborhoods, cultural centers, beautiful open spaces and a thriving food scene. Popular attractions in Chicago include Navy Pier, Millennium, the Art Institute of Chicago and the Willis Tower. Plan your travel to Chicago at the right time and you will be able to find the best airfares available. 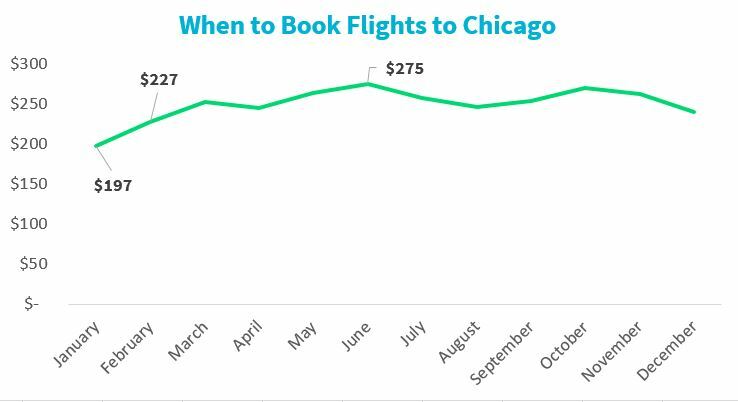 Skyscanner has worked to help you find the cheapest time to fly to Chicago and increase your chances of securing the cheapest prices on air travel. This includes the use of our cheapest month search feature, our search everywhere tool and the ability to set up price alerts. Simple, painless, and saves travelers a lot of time + money while planning for your next trip!